Moist. Woods. Full or partial shade. This is a 24″ to 84″ tall, erect, perennial forb that rises on an aerial stem from a stout, long-creeping rhizome. 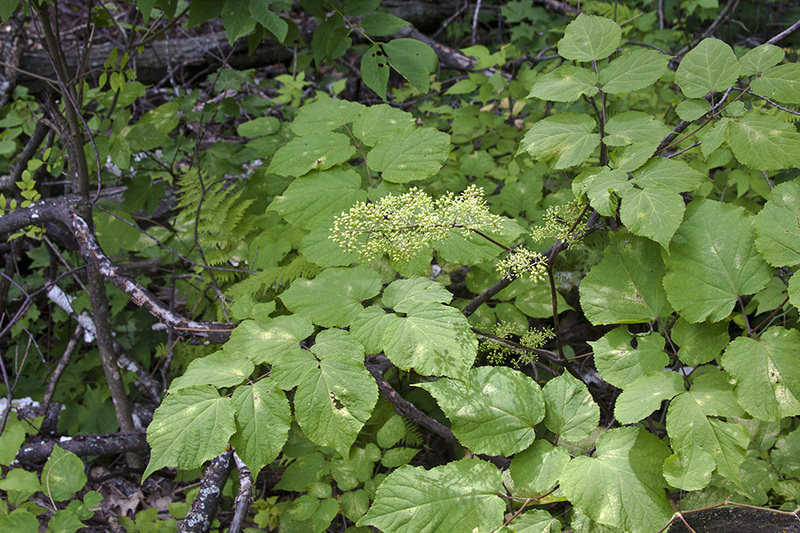 The stems are erect to spreading and often branched. 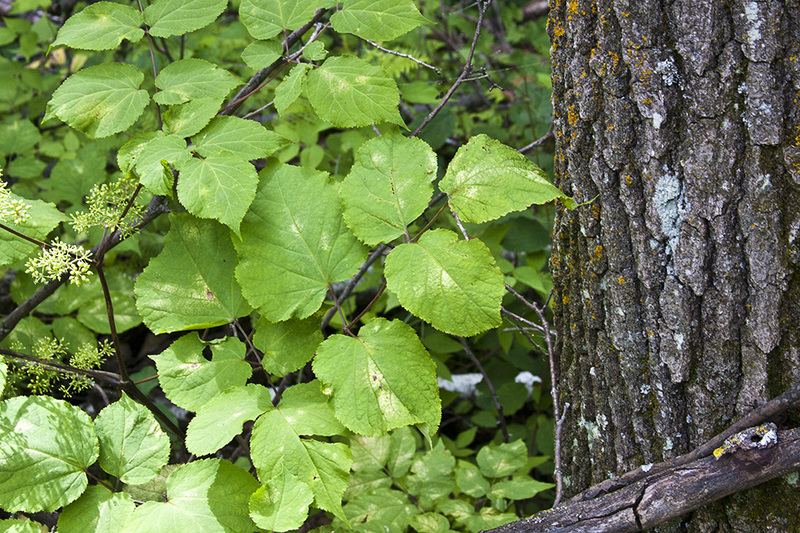 They are green to purple, hairy, and sometimes slightly woody at the base. They do not have spines and are not bristly at the base. 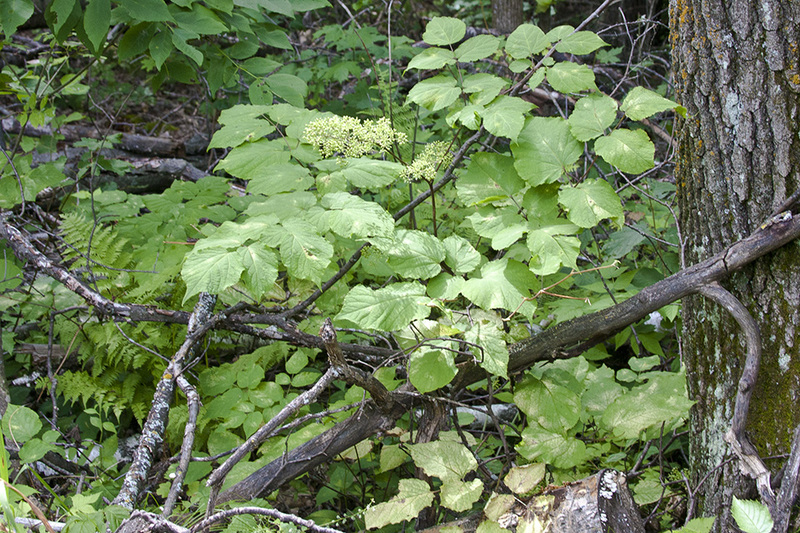 The leaves are alternate, widely spreading, and divided into 3 main segments. Each segment is further pinnately divided into 9 to 21 large leaflets. This results in a plant that appears very leafy though it has few leaves. The leaflets are egg-shaped, ¾″ to 7″ long, and up to 5″ or more wide. 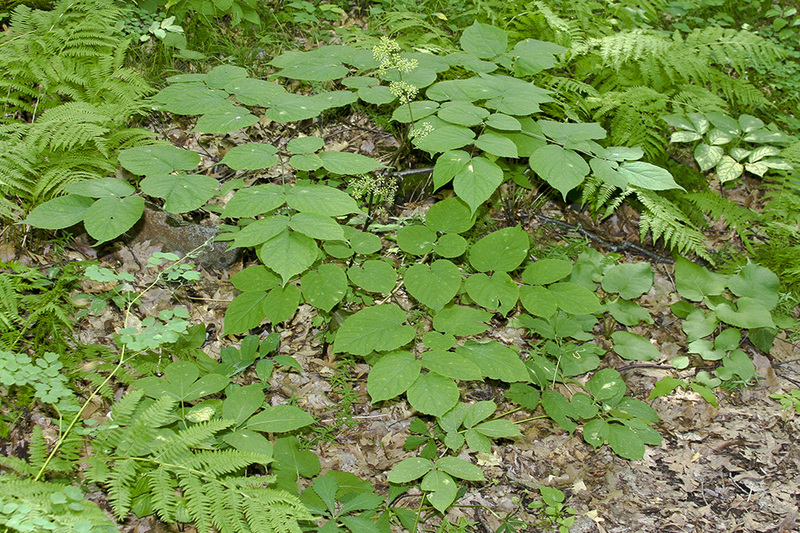 Leaflets of various sizes occur on the same leaf. 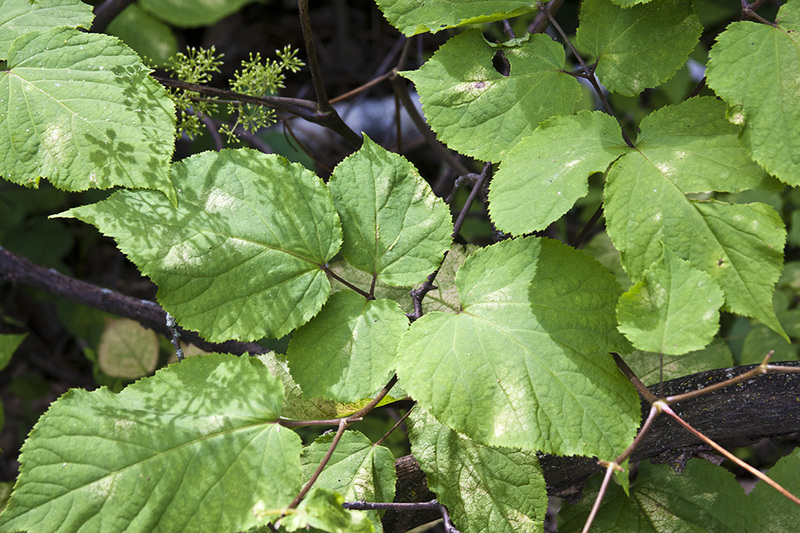 The leaf blades are heart-shaped and asymmetrical at the base. They taper to a point at the tip with concave sides along the tip. The upper surface is green and covered with short hairs. The lower surface is paler green and is hairy along the veins when young, becoming hairless or almost hairless at maturity. The margins are toothed, sometimes doubly toothed, with sharp, forward pointing teeth. 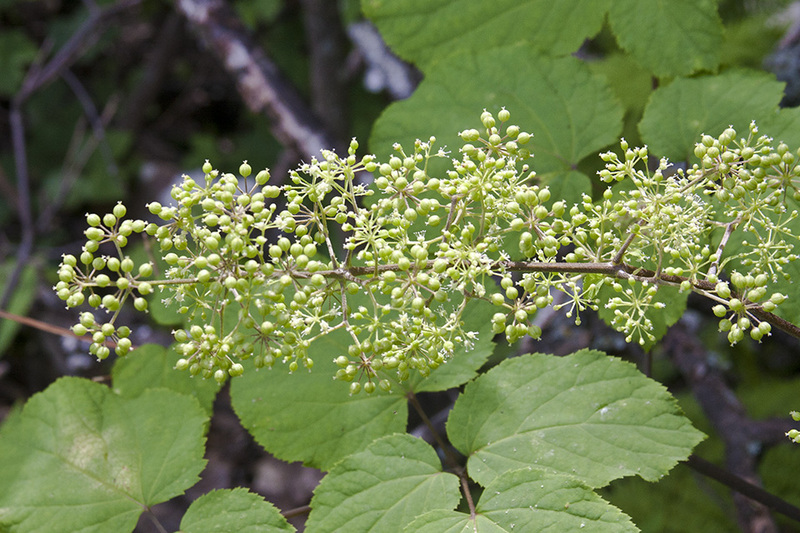 The inflorescence is a branched array (panicle), up to 12″ long and about 2½″ wide, at the end of the stem, and sometimes smaller panicles rising from leaf axils. The panicle consists of numerous umbrella-shaped flower clusters (umbels). 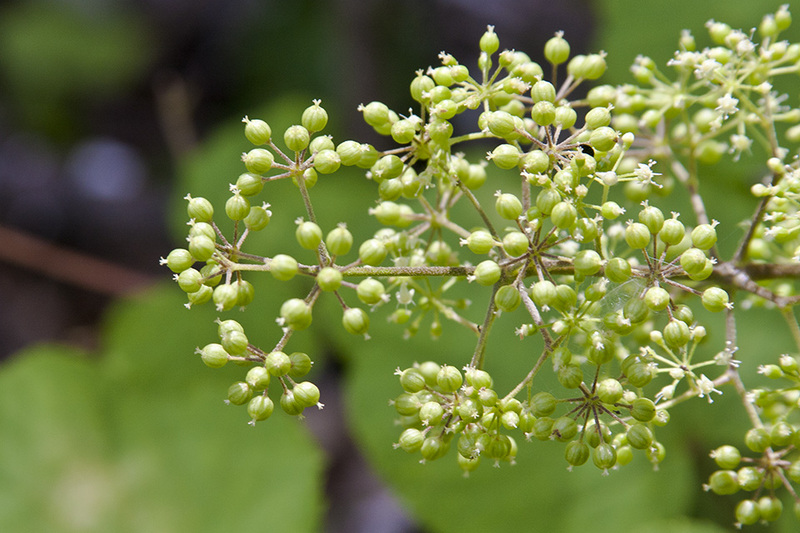 Each umbel has up to 10 or more flowers. 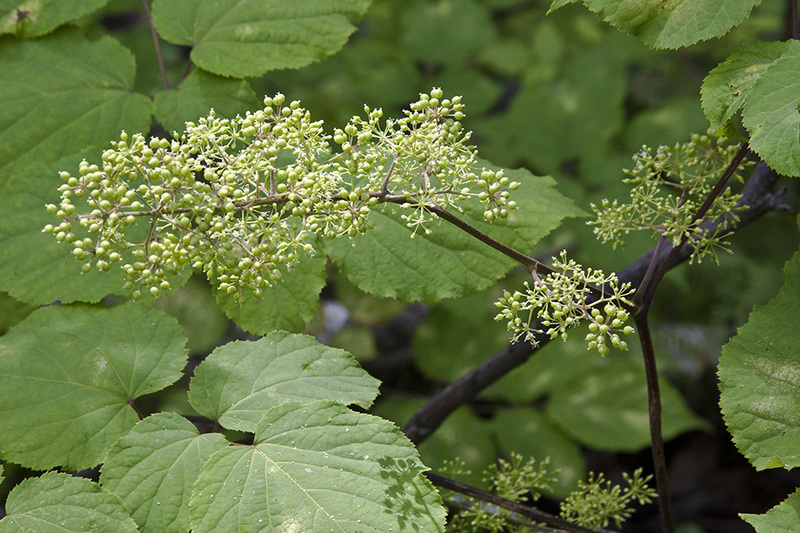 The flowers have 5 white or greenish-white petals and 5 stamens with white filaments and white anthers. The fruit is a fleshy, dark purple, berry-like drupe.